The WindyNation 100w Solar Panel Off-Grid RV Boat Kit – Works on the principle of capturing energy from the sun. Gathered energy is passed through to the charge controller which in turn feeds it to the battery for storage. The primary role of the Off-Grid RVs is thus, nothing but battery charging. WindyNation 100w complete kit has everything needed to produce free and clean power from the sun. Whether this is for a boat, cabin or power backup, this kit has everything needed for providing the power. On the top of it, it is also simple to install and comes at an affordable price. 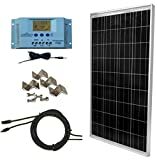 The home solar panel kits include a piece of 100-watt solar panel, User adjustable LCD 30-Amp Solar Charge Controller with Battery Temperature Sensor, 40 feet of UL Listed 12 AWG Solar Cable, all necessary MC4 Connectors for wiring, and all the necessary mounting hardware (4 Solar Panel Mounting Brackets and Fastener Sets). A 12-volt battery and a DC-to-AC convertor is all that is required to turn the energy of the sun into power. A digital display also comes along with this kit and this display provides system information about the battery voltage, temperature, etc. The charge controller has MODE, UP and DOWN buttons to adjust system settings like voltage of solar disconnect, voltage of load disconnect, etc. The WindyNation 100w home solar power system is designed for multiple applications. Whether it is used in a boat, RV or at home, it is simple to install and use. Depending on how sunny the day is, it is capable of generating 350Wh per day. Here are some of the top features of the product. The kit comes with a 100-watt WindyNation Solar panel for use with a 12-Volt system. The one panel given in the kit is perfect for charging a 120volt battery bank.But if the user wants to use more solar power, it is possible to do so. The controller has the capacity of handling up to 4 100-watt solar panels (12-volt system) or 8 100-watt solar panels (24-volt system), thus providing an average of 350 Watt Hours or 33 Amp Hours of charge per day depending on the availability of sun light. WINDY NATION WN-100W-KIT USER MANUAL Pdf Download. WindyNation’s Solar panel is UL 1703 certified and the efficiency is high along with long term usability, reliability and stability. Its electrical performance is outstanding even at high temperature and low irradiance conditions. This is an external temperature sensor. This sensor is software controlled and accurately adjusts over charge and over discharge voltages in order to maximize the batteries’ life. The Charge controller is WindyNation’s P30L PWM 30 Amp solar charge controller. This controller has the ability to prevent the battery from overcharge. This ability saves the battery from damage due to overcharge by the solar panel. The controller has been designed to provide multifunctional charging and power management for solar charging of 12 and 24-volt battery systems. The controller has a detect function to identify the battery voltage upon connection. There is also an inbuilt protection to provide protection to the battery during overload, short circuit, reverse polarity, lightning/surge, PV Panel Reverse current, overcharging and discharging. This helps the system in remaining undamaged in the event of short circuit or overload. The parameters of these controller can be controlled by the LCD screen display. The controller is enclosed by using durable plastic. The charge controller has an LCD display. With the LCD display, it is easy to adjust the different settings and the power output of the instrument. The LCD Display also displays various other factors like the DC load draw, temperature, voltage, amperage, and a lot more, with the charge controller. The Mounting Bracket and fastener set is made up of anodized Aluminum and stainless steel. These are corrosion resistant materials and has a longer life. There are 4 anodized aluminum brackets Z-brackets and 4 sets of stainless steel fasteners. These brackets and fasteners helps in quickly and easily mounting the solar panel to a boat, roof or RV. The UL listed 12 AWG solar extension cable is continuous and 40 feet long and it comes along with a pair of MC4 connectors. The MC4 connectors provide for a waterproof connection of the extension cable to the connectors attached to the back of the solar panel. The best solar panel kit is selected based on the specific application it is required for. So, the negative points vary depending on the usability. A feature that is considered negative for a particular use might not be so, for another. Here are some points considered as negative in this kit. The manufacturers claim this to be a complete kit while few users feel that the kit lacks few equipment like fuses to set it up properly. As battery is not supplied as a part of this kit, buyers have to buy their own. There are limitations on the power and hence, it can be used only in some situations that do not need much power.This is a low-end model and does not suit the needs of those who are in need of more power. WindyNation 100 Watt Solar Panel Off-Grid RV Boat Kit is a complete off grid solar systems. The benefit of off-grid solar energy system is to not worry about the local electrical utilities and becoming energy independent by decreasing our dependency on fossil fuel. But it is required to invest on the batteries and other energy storage. WindyNation’s 100-watt panel is the best panel for the price. The kit has the following advantages over the competitors. The performance and power is quite impressive and many buyers find this to be the best choice. People have used this kit with ease for three days with two batteries. This is enough for supporting situations like short boat trips/tours. The setup of this kit is easy when compared to other kits in the market. The components are not complex and they fit together. The components are made of reliable materials. The kit comes with a set of instructions that is very easy to follow even by beginners. The price of the kit is very much affordable. This is the best type of kit if one is looking for a starter panel in order to help in reducing the utility bills. This kit works beautifully even on cloudy days while many of the kits in the market are not so efficient during overcast weather. It has a warranty of 5 years, which is really fantastic. The WindyNation off grid solar system packages provide everything required to produce free, clean power from the sun. It is designed to provide the required solar power that the users need on their RV or on their boat. This is suitable for buyers who have short term plans and have low potentials on power outage. One can set this kit with the help of a solar power system calculator. Based on the total energy needed, the hours of usage and the amount of daylight received, the calculator recommends the number of panels required and the capacity of the battery required for the setup. As the kit can be extended up to 4 (or 8) more solar panels and has a 33-amp solar charge controller, the setup is easier. With plenty of positive reviews from the users who bought this kit, this is a kit worth buying and trying. 1.2 WINDY NATION WN-100W-KIT USER MANUAL Pdf Download.